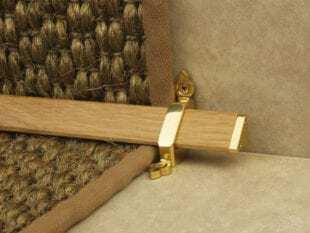 The choice of stair rod styles, finishes, shapes and sizes is fabulous! Many of the stair rods we supply are made to measure, to suit your staircase and width of runner of fitted carpets. please do take advantage of this personal service to ensure your rods are of the best quality and look the part for many years to come. We do also sell off-the-shelf stair rod designs, the Homepride and Jubilee, which you can cut to length at home. If you are looking for solid stairrods, please take a look at the six designs in the Premier Collection and if you prefer the flat-face style, then the Royale range will appeal. And when you come to order, you may find our guide on how to measure up for stair rods is useful. 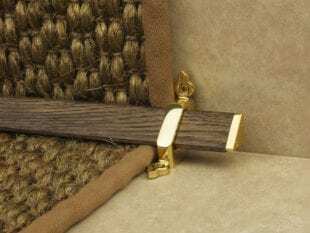 Stair rods come in a variety of finishes including popular antique brass and polished brass. A more contemporary look is the brushed chrome or satin nickel finish, whilst the Tudor wooden rods have a lovely, natural appeal. Choose from our comprehensive range and have them delivered to your door. Take a look at our online gallery before deciding and be inspired! For most UK orders P&P is free. If you need some technical advice, we’ll be pleased to help.